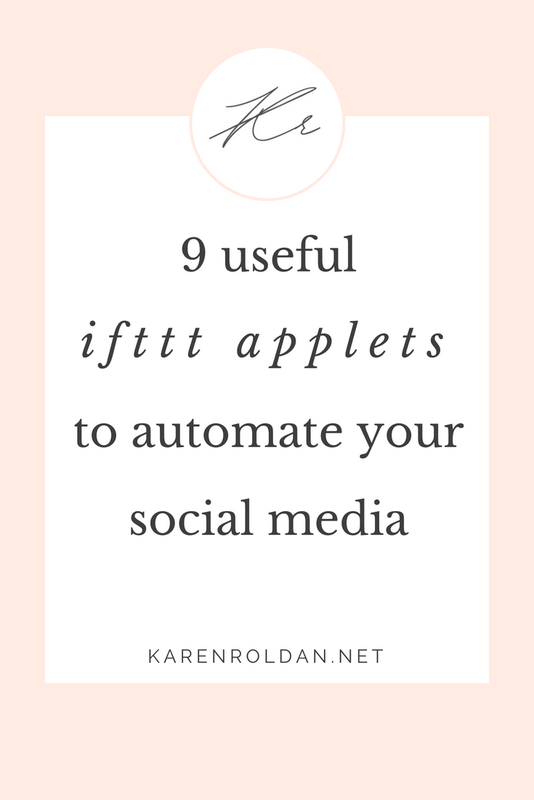 I'm using several tools, but I want to introduce IFTTT to you. It basically fills the gaps between your applications by creating applets. It's so easy to make one; but, there are applets that are already made, so you just have to choose from the list. I'm using the following applets in automating my social media, from sharing a content from one application to another. If you are following me on my Facebook page, all you could see are my blog posts. I know I really stink in updating it, but Facebook has a lot of negative vibes! Anyway, my updates from my Facebook page will be posted on Twitter too. In that way, I don't need to manually post the same update on twitter. I use my Facebook account in this applet. Whenever I post a new photo or photos on Facebook, these photos will be shared on Twitter as well. Of course, I have to keep my profile pictures in sync! This applet makes it possible for me to not go through the hassle of updating my profile picture on Facebook AND Twitter. I have different settings on this applet. Depending on the main category or tag of my blog post, I indicate which should be pinned to my board on Pinterest. This applet helps me organize my pins. Facebook Page is where I share my blog post, aside from twitter and Google+. Most of my traffic is from Facebook, so I always make sure that my blog posts are shared on my Facebook page. The advantage of using this applet is I could mention people and add hashtags together with my blog post! The only way to share my blog posts to Google+ is via buffer. Currently, there's no available applet that would allow me to post from WordPress to Google+ directly. I don't really use Google+ but if I have to target my audience there, at least I already have contents. I have followers there who are not following me on IG. I really like the photos that I'm posting on IG, and I want my Facebook followers to see these photos too. Sharing my pictures from IG as native Twitter photos saves people time from that extra click. People could easily see my photos, instead of redirecting them to my IG. How do you automate your social media? Feel free to comment it below! I would love to discover new tools.